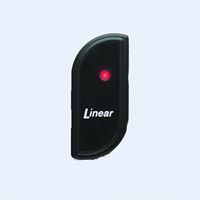 For adding proximity sensing to any access control system, Linear offers the AM-PR Proximity Reader. This close-range radio-based reader works with either proximity tags (Model AM-PT) or proximity cards (Model AM-PC), both of which are slotted to attach to key rings. Upon reading a user’s tag or card, it transmits the entry data via a Wiegand output in virtually any format up to 40 bits. An integral LED confirms to the user that access is granted. Works with both proximity tags and proximity cards. Compatible with all Wiegand formats up to 40 bits. Weather resistant and vandal resistant. 4 to 6 inch read range. Supports up to 65,000 cards. Integral LED confirms when user access is granted.